Image: Ford. Altered by Jason Torchinsky. 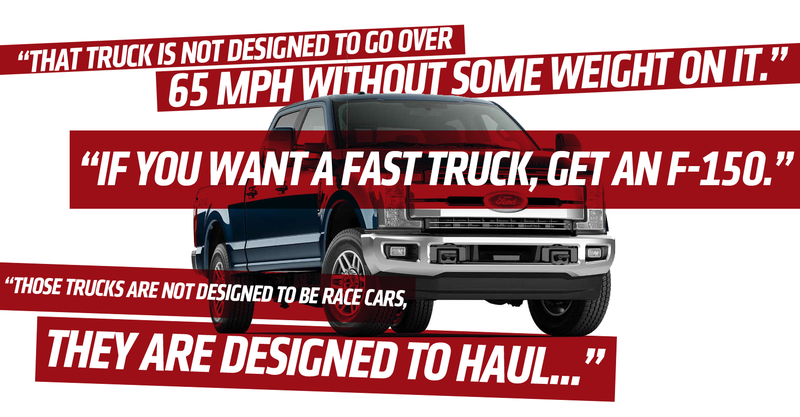 A Colorado man recently took his new Ford F-250—which had a violent front-end shake on the highway—to a dealer, only to be told that the truck was “not designed to go over 65 mph.” It’s a ridiculous and untrue claim in what is just a baffling audio recording. Just listen to this nonsense. The AutoNation employee’s recorded statements in the video in question are not a reflection of AutoNation’s ideas or standards when it comes to our customers’ service experience and we regret that he was given false information. As the nation’s largest automotive retailer we strive for excellence in customer satisfaction and safety. When this customer brought his F-250 to our service center we were unable to recreate the issue which is when we initiated the buyback process between the manufacturer and the customer. It’s our understanding that this process is currently underway and we are no longer involved at this time. On that last part about a buyback: Ford says that didn’t happen, but that instead, the customer—whose truck had 22,000 miles on the clock—simply had a bad ball joint fixed under warranty at a Ford dealership. Ford’s representative told me the man has his truck back, and that FoMoCo is following up with him to make sure he’s satisfied. According to the interviews, there seems to have been quite a bit of drama between Brenden and the AutoNation dealer. Apparently, the job had taken three weeks, which was too long, and that put Brenden on edge. Some choice words were supposedly exchanged between him and the dealer, and the police were apparently called. I’m still left with some questions, like why did the person in the recording say what they said (in the Facebook interview above, Brenden says the person was a “communications manager”). The AutoNation statement says the person “was given false information,” but from whom? My second question is: why couldn’t this dealer diagnose something as simple as a faulty ball joint? In any case, it looks like Ford stepped up to investigate, and ultimately took care of the issue. AutoNation admitted its fault. The Littleton dealer itself told me it spoke to the customer face-to-face and resolved the issue. And now the owner has a new ball joint on a nice, new truck that hopefully doesn’t feel like it’s about to shake apart on the highway. Seems like a happy ending, to me. Car Dealers: What Are Your Most Outrageous Customer Stories?